Nothing like a good double take to wake you up on a wet and dismal morning. That is what happened to me today on my way to Ipswich on a rain splattered 32492. 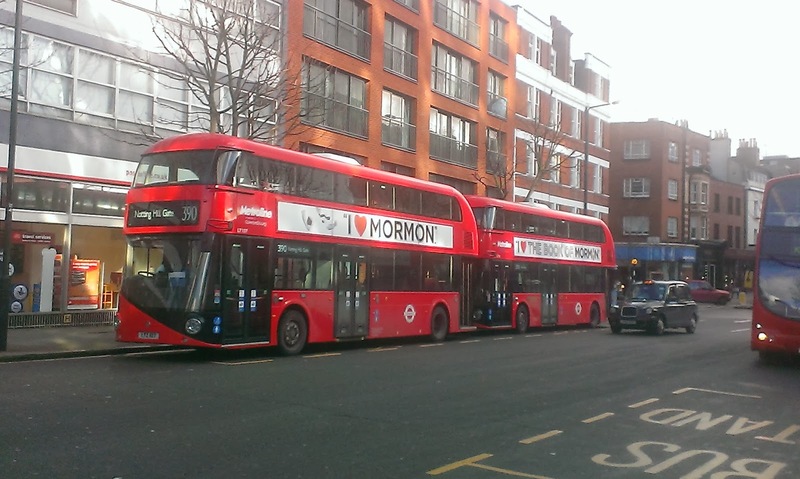 A bus passed the other way and I did a double take Rowan Atkinson would have been proud of. I saw nothing else but a partially white blind box. That could only mean one thing - Norwich had invaded Ipswich and even better hadn't been reported elsewhere! So I carefully worked out what time said invader was due back and lay in wait. And waited. And waited. 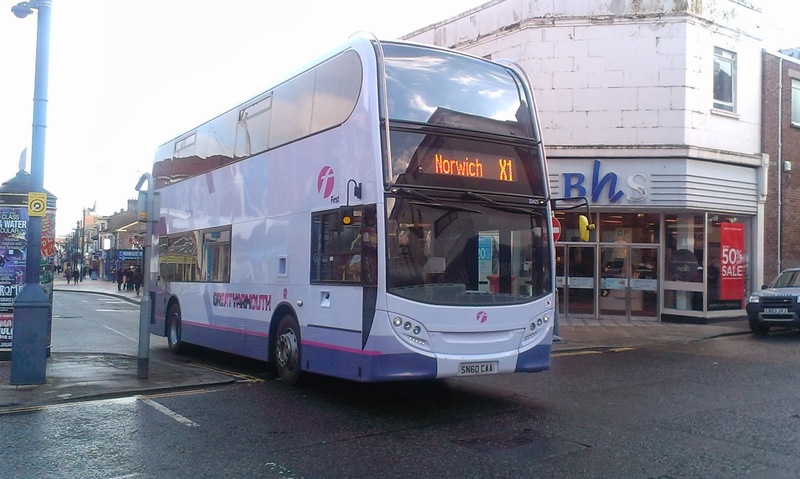 Eventually I decided to find out directly and went to Ipswich depot, where I was told that yes, Norwich Volvo 66333 is indeed on loan to Ipswich after being at Braintree for a few weeks while 69005 is away being repaired from the damage suffered in Stowmarket. It was suggested that no mechanical faults were found on 69005. Anyway the reason I waited so long is it had broken down with brake trouble. Thanks, Norwich for sending one of your finest - and why a branded vehicle? 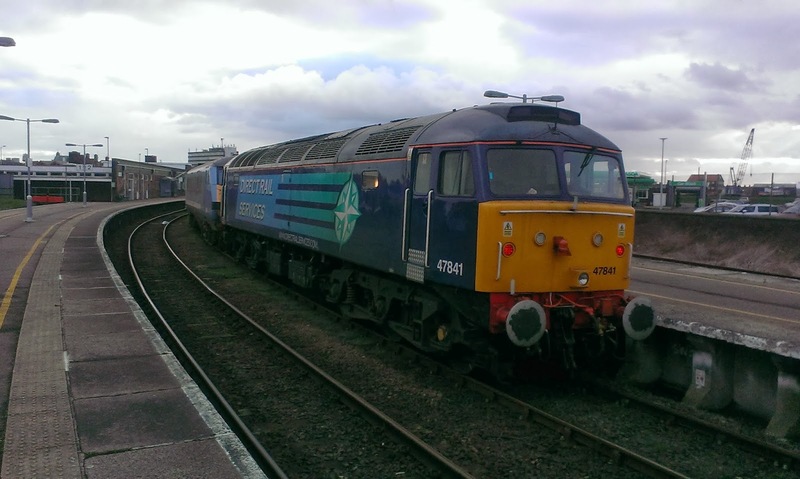 As luck would have it as I was leaving the depot 66333 returned so I got my pic after all. 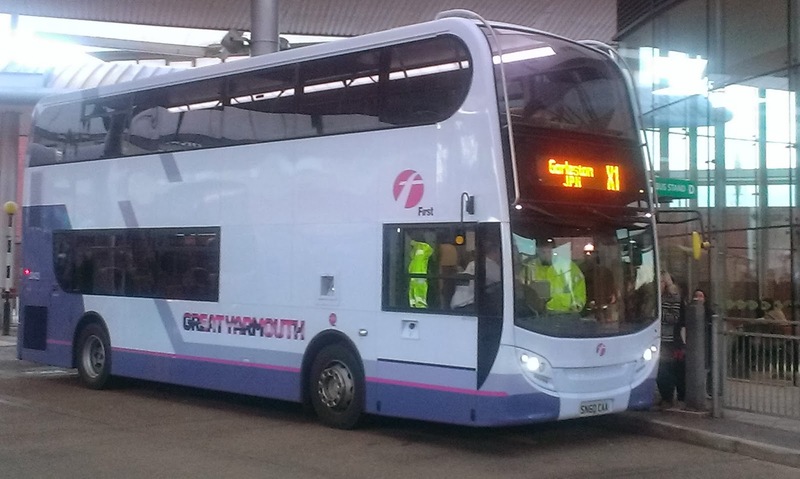 Steve's Bus and Train Page is proud to be the first to bring a pic of one of the ex First Leicester Volvo B7 ALX400's to enter service at Great Yarmouth. I ventured down to Beach Road coach station today to see what was on the BM contract and low and behold 32062 appeared minus any destination screen, accompanied by 37575. A spot of good luck which ran out when my "close up" pic failed to take properly so this is it!! I have some nice things to say, which after my last post is somewhat of a relief! Firstly I would like to say thank you to all at Suffolk Links. 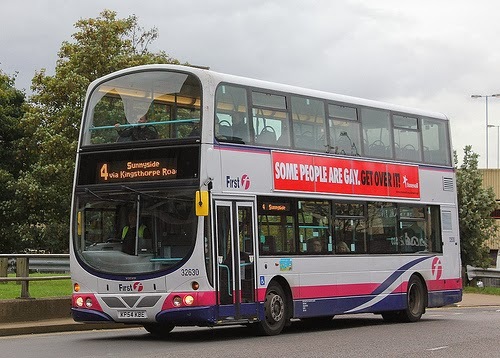 You can never fully replace a proper bus service, where you can look out of the window, think it's a nice day and hop on a bus which you can't do by having to book in advance. However I have found the service nothing short of excellent, the ladies on the booking service bend over backwards to fit you in when you want, and the drivers are all decent, knowledgable and have always been on time, normally early. One even texted me last week to say he'd be 6 mins late. Thank you Suffolk Links and I'm not worrying about the lack of a car nearly as much as I thought I would. Secondly a big thumbs up and well done to Anglian. 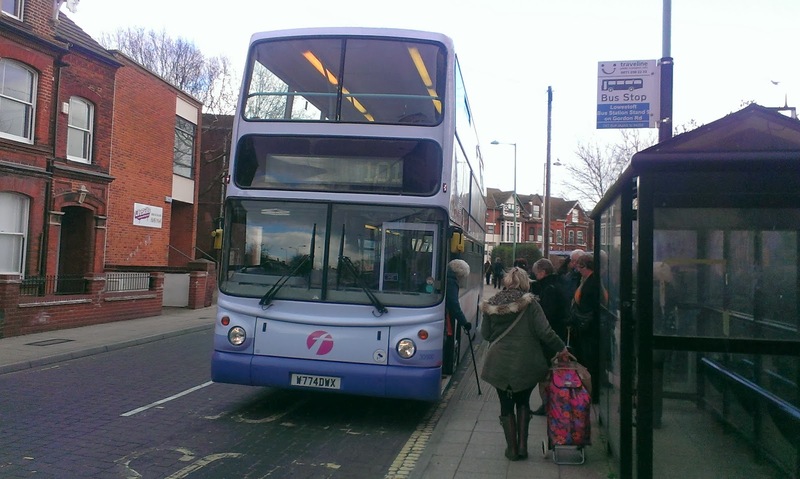 A few weeks ago I mentioned that gas bus 100 had a rattly window and said it was pointless having a quiet bus when a rattly window effectively disturbed the peace. Today I travelled on 100 for the first time since that post and the window has been fixed and no longer rattles. Kudos to Anglian for having that fixed - it makes such a difference. I love Scanias. The favourite bus from my youth was a Metropolitan Scania. The best bus I drove was a Scania. The best coach I ever drove was a Scania. I love the Omnicity Dekkas - the ride more than the seats! I think the Scania 113 engine is one of the best bus engines ever built. 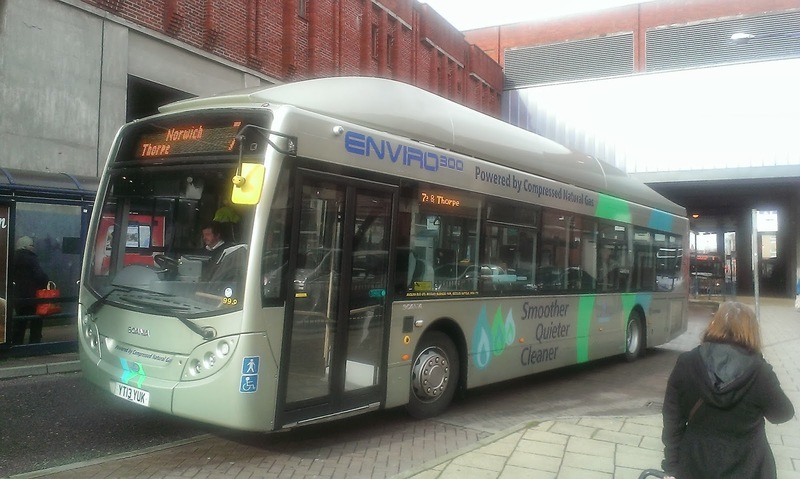 So when I read yesterday that Anglian are trialing a Scania gas bus it seemed like all my Christmasses had come at once. 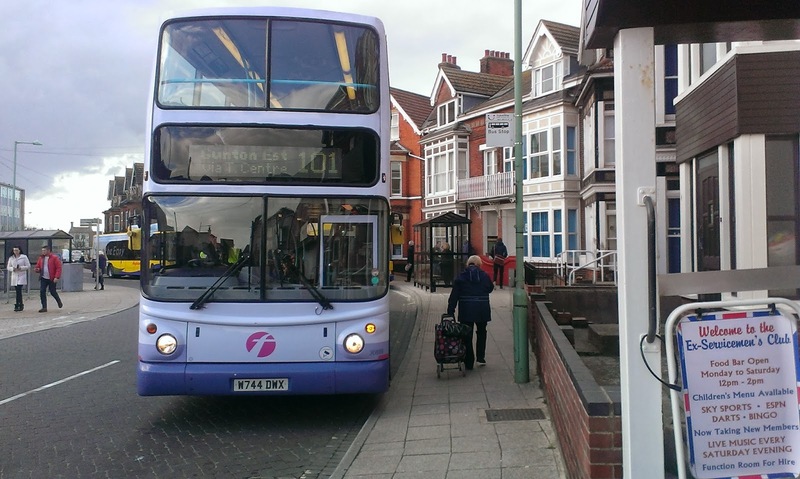 So this morning I set off to sample this Mecca of buses, and at 1147 precicely boarded Anglian 999 at Lowestoft Station. 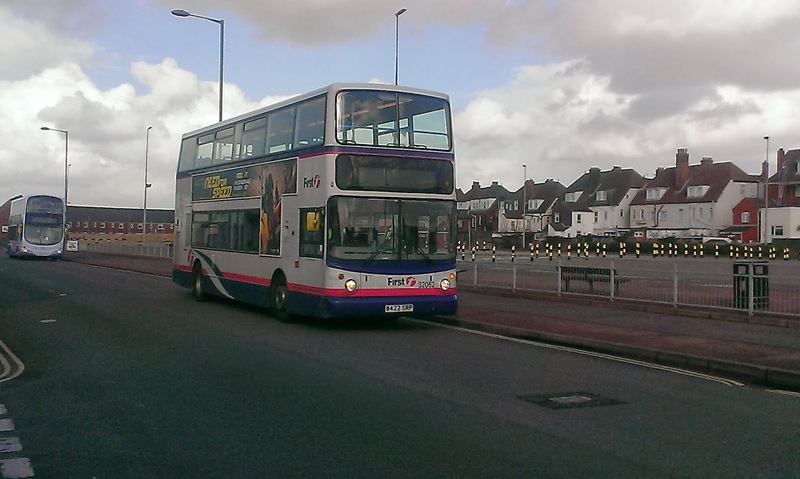 Anglian 999 AD Scania E300 gas bus YT13 YUK at Lowestoft Station just realised showing completely the wrong destination! Minus destination which is due to my camera not the bus. So where to start. 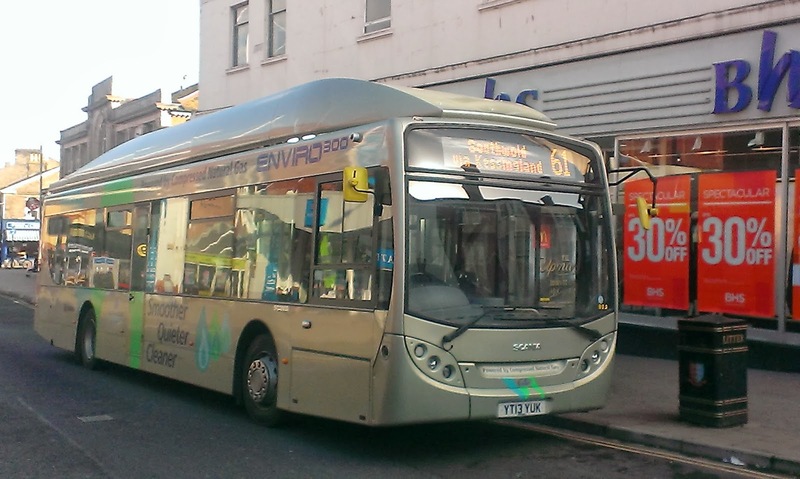 I had initially arrived at Lowestoft on MAN Eco City gas bus 102 so a quick comparison was easy. I'll break it down into different sections. First of all the Scania is noisier than the MAN. Sometimes it's difficult to tell if the MAN engine is on or not. That is not possible with the Scania. It whines and is not anything like as good a soundtrack as the MAN. The suspension is rougher, the acceleration not as smooth and the air con is noisier than the MAN. Oh dear. Can someone tell me how Portugal can build a bus body that doesn't rattle and Britain - who built the best bus in the history of buses - the Routemaster which doesn't rattle 50 years on - can't! I checked with the driver who said the Scania had done 17,000 miles and the rattling was embarrassingly more accute than the MAN's. I'm not sure what the mileage on the MAN's are but I'm willing to bet it's more than that! All the more baffling is that in the 80's and 90's Alexander built the least rattly bodies going - I drove Volvo Citibuses in London that had Alexander bodies and not a rattle between them, so what's happened? 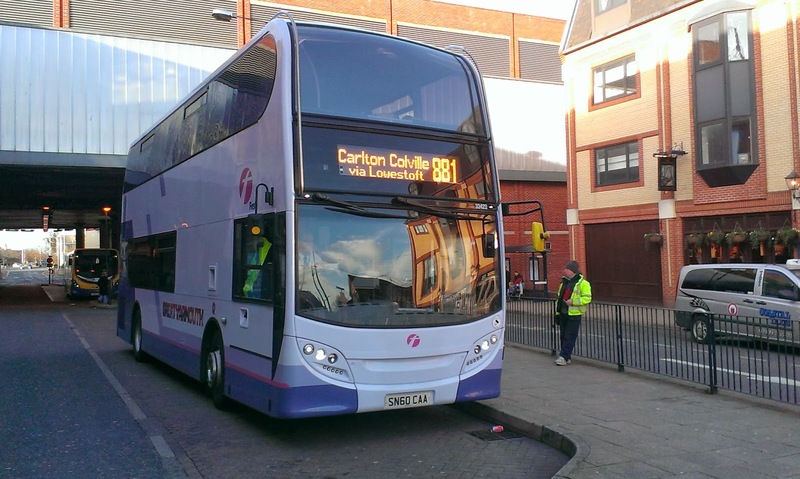 Why do Britain's new buses rattle so much? I didn't intend to have this category but it was the one positive I found with the Scania. I know the MAN's can be a tad difficult to brake at times, and the Scania felt safe and solid in the braking - the driver confirmed that. He really liked the Scania. The Scania looks great from the outside. I saw it from above in Market Gates Shopping Centre later and it's really streamlined on top. I also like the MAN's look so I guess it's a tie there. I went out today to really like the Scania. I wanted to like the Scania and I'm seriously annoyed that I can't like it. I'm sick of writing negative reviews and comments about vehicles I want to like, and SHOULD like if the quality and yes workmanship were up to scratch. 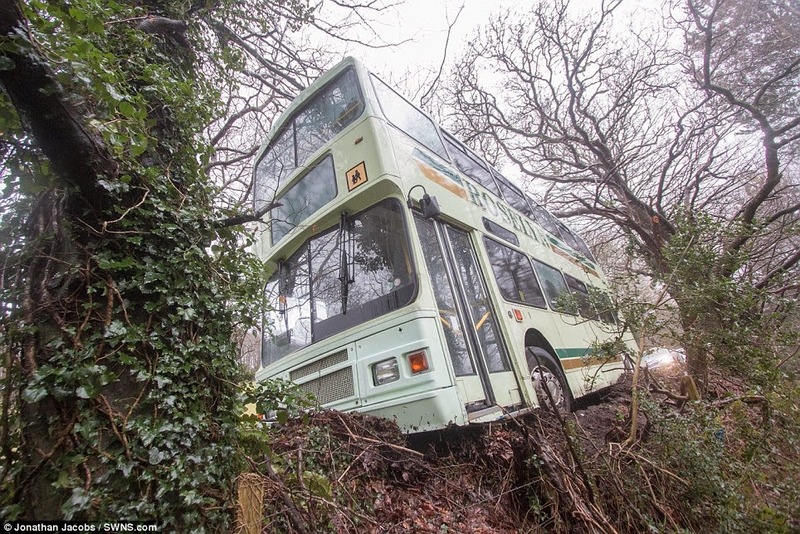 Quite simply Britain can't build a bus these days that retains quality and comfort like the Routemaster or Olympian did. Very sad indeed. So Scania or MAN? Man that's an easy decision. Just realised how appropriate the last three letters on the registration are! The end for X1 Excel coaches 20514/5 has been predicted for a few weeks now, and both of them have seen active service elsewhere in those weeks. However, both today were reunited on their old patch working the X1 shorts. I managed to capture them both in the space of 10 mins at Yarmouth Market Gates today. Anyhow my opinons aside if you are interested please contact Rob at bertiecollins123@sky.com and he'll give you all the low down. I'll be in touch soon, Rob so save my place!! 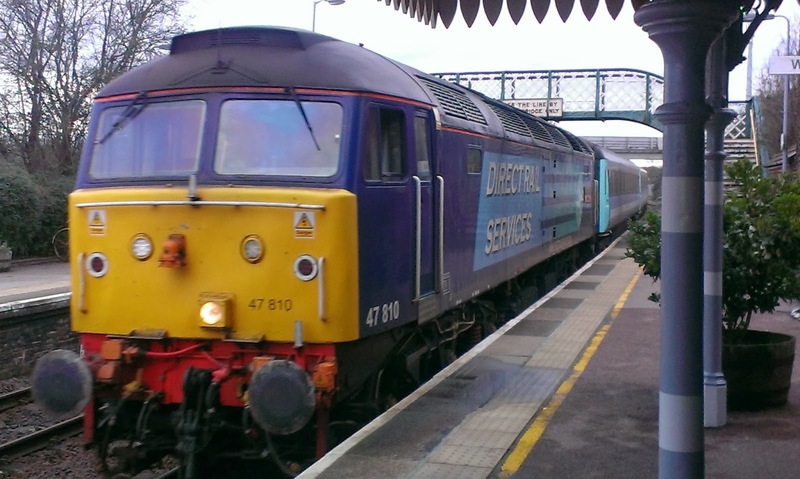 After shivering under my duvet over the weekend I was sufficiently recovered enough to go to Lowestoft to catch the "short set" to Norwich on its regular 1057 departure. After suffering the indignation of a Solo instead of a gas bus (102 suffered a broken windscreen due to bird strike this morning) I got to Lowestoft Station just in time to see 47810 lead the short set in, with freshly painted 47818 bringing up the rear. 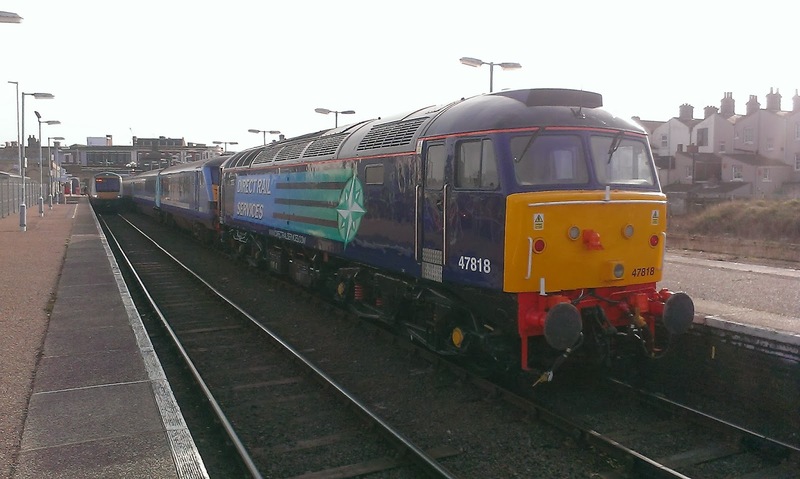 Apparently known as "Emily" 47818 replaced the unreliable 47813 last week. 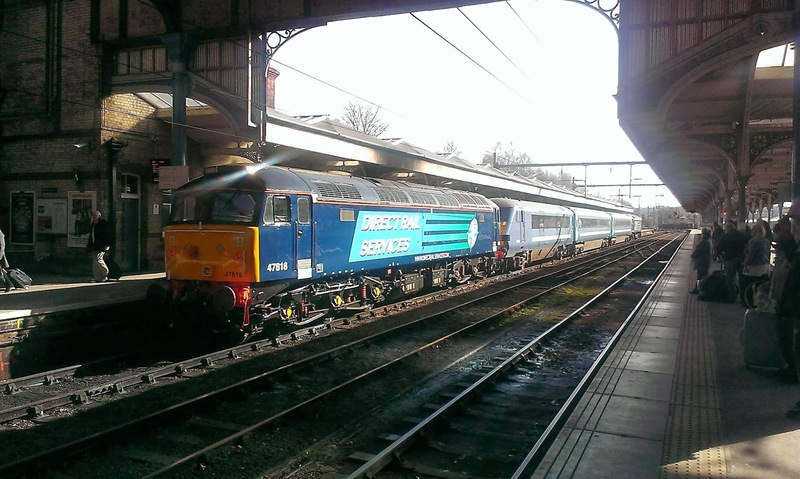 It is rumoured that the 47's are soon to be replaced by 37's and tonight 3 Mk II coaches are arriving at Norwich behind 47853 specifically for the "short set". On my way down to Kent on Tuesday I stopped in London with the intention to ride and photograpgh Borismasters on every route they operate on. I came very close to achieving it. 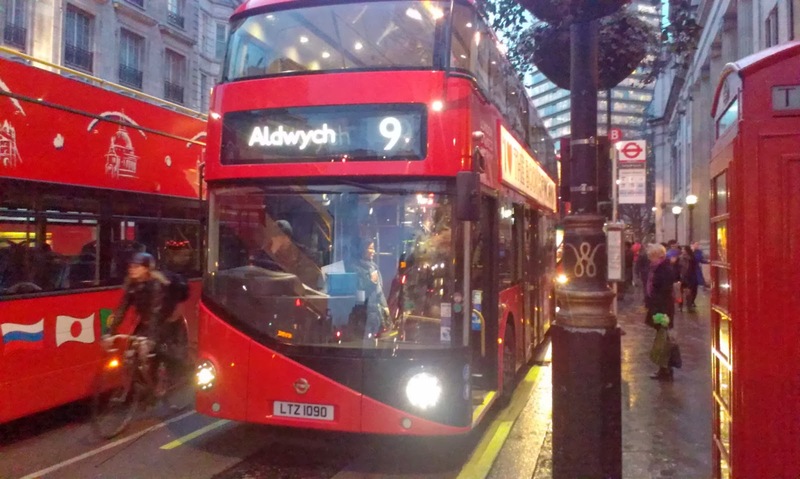 Right now Borismasters operate on routes 9, 11, 24, 148 and 390. There are a few floating around on the 38 but that route is still predominantly operated by other vehicles. 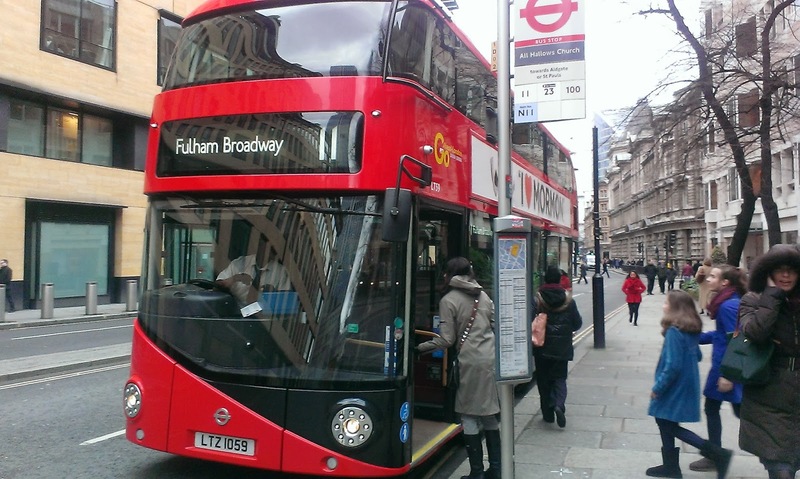 So I ended up catching the 11 from Liverpool St - Victoria, the 24 from Victoria - Pimlico and back, the 148 from Victoria - Elephant and Castle from where I went to Waterloo on the 172 (a very rattly E400) to do the electric bus back to Victoria. 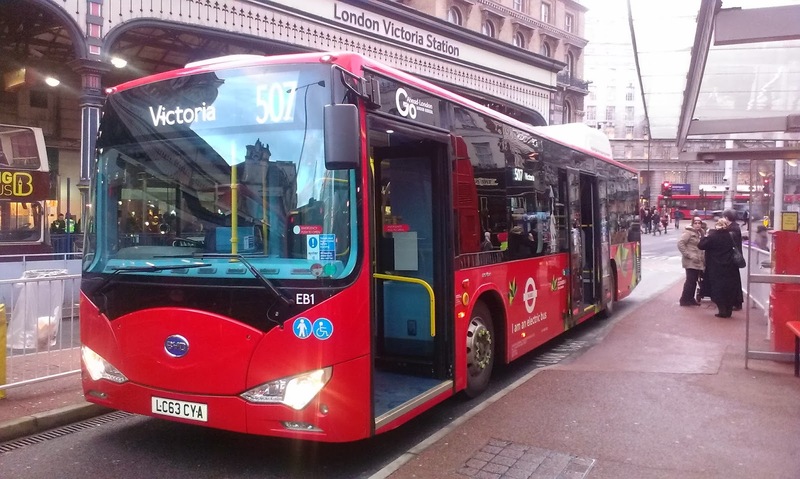 I then caught the 38 (not a Borismaster) to Green Park where I caught the 9 to Trafalgar Square. That just left the 390, which doesn't go through Central London, running from Notting Hill Gate - Archway. So on Thursday, while taking an extended "cross London" journey between main line stations on the Circle Line the staff at Notting Hill Gate Station kindly let me out for a few mins so I could get some shots of the 390. 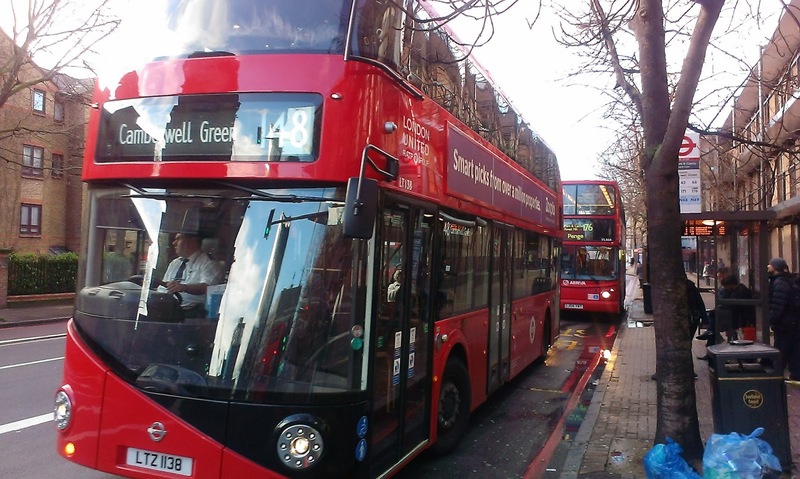 I didn't ride one but plan to next time now I know the 148 also passes through Notting Hill Gate. 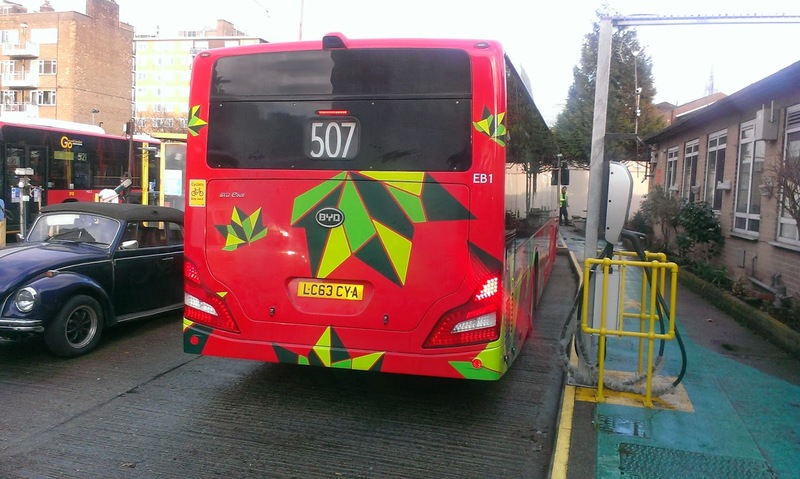 I really like the Borismasters, but in no way can I see them lasting 50 years like their predecessors. 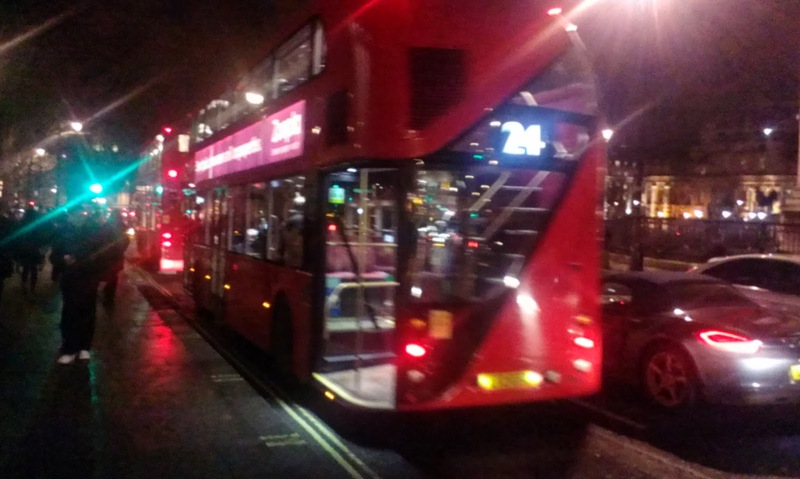 They have been well designed, seem more solid than other new buses, and I love the illuminated side adverts that become obvious after dark. But like everything else let's see what condition they are like in 3 or 4 years time, and only then will we be able to really judge. LT107 at Notting Hill Gate terminus of the 390. Don't know what the one behind is. It would appear I've been living in a cave. 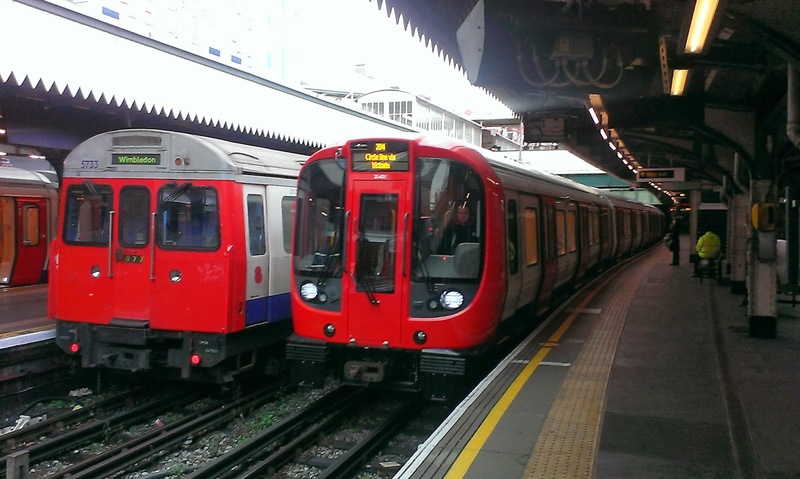 Last year I did a feature on the new trains for the Metropolitan Line without realising the new S Stock trains for the Circle Line were on the way and about to be phased in. 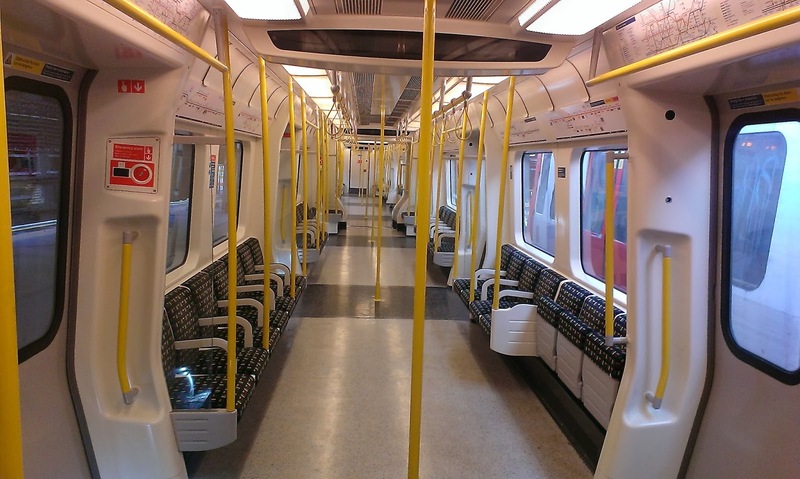 Last Tuesday (11th) saw the Circle Line completely operated by the new trains for the first time. Compared to the old C Stock the S Stock are 7 coaches compared to 6 on the C Stock, 24 metres longer (117m compared to 93), and can carry 865 passengers compared to 739 for the C Stock. So having spotted one on Tuesday I decided yesterday to spend a couple of hours on the Circle Line to see what the new ones were like. 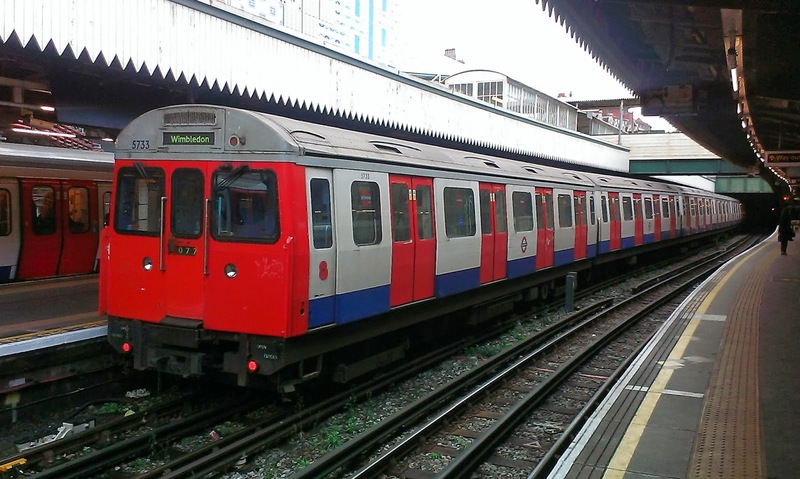 They are quite similar to the Metropolitan Line trains, except all the seats are side facing, but are certainly faster and smoother than their predecessors, which have been in service since 1970. You can still find C Stock on the Edgware - Wimbledon branch of the District Line but I don't know for how long. 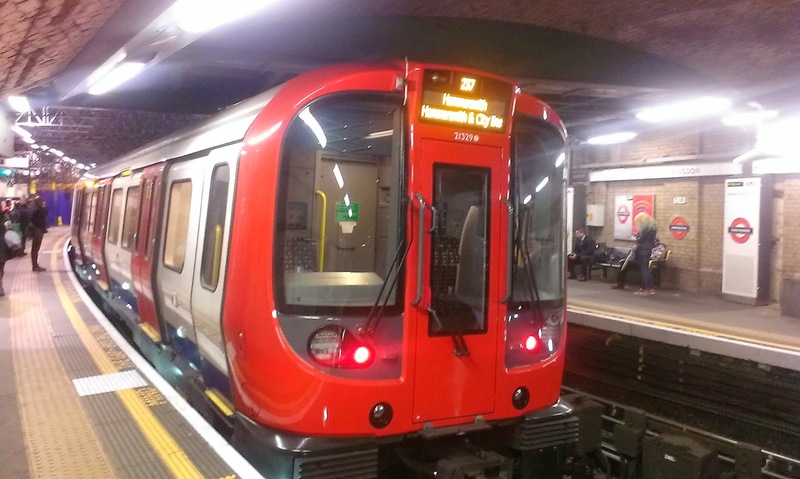 These new trains mean that only the Bakerloo and Piccadilly lines still have rolling stock I remember from my childhood. I'm not sure when they are due for replacement. I have returned, with a very red eye and lots of pics, First of all Anon, Zak and Sam I'm not sure whether to say well done, or you guys seriously need to get a life!! 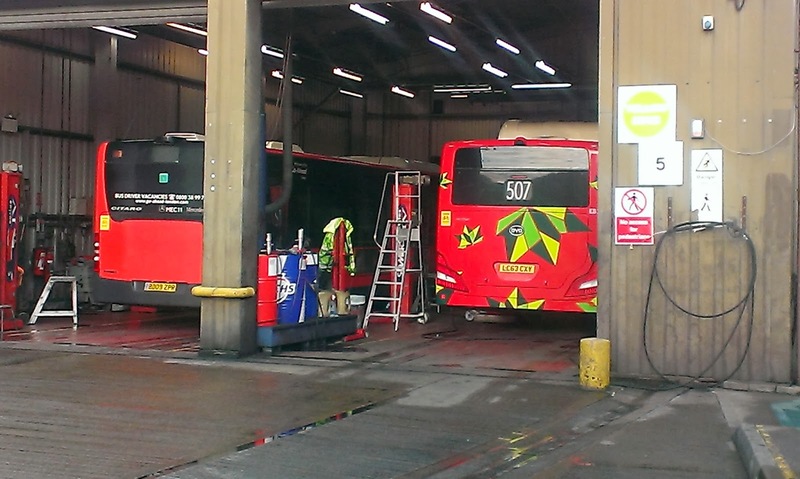 Yes, it is indeed Electric Bus EB1, which I was lucky enough to photogrsph at Waterloo Bus Garage. Both of them were in the Garage when I got there, but the Duty Manager told me when the one not suffering a power cut was going to be out, so I got a ride on it to Victoria. Verdict? Erm noisy and rattly and sounded like a tram on tyres. Not the quiet smooth journey I had envisaged. Anyway here are the pics I took of them, but I'll be surprised if they are the future of bus travel so these pics may be collectors items in a few years!! My grateful thanks to the driver for directing me to the Garage, and the manager for allowing me to take the pics. Had a great day in London today en route to Kent. There will be a full report when I get home but here are a couple of pics I took today. 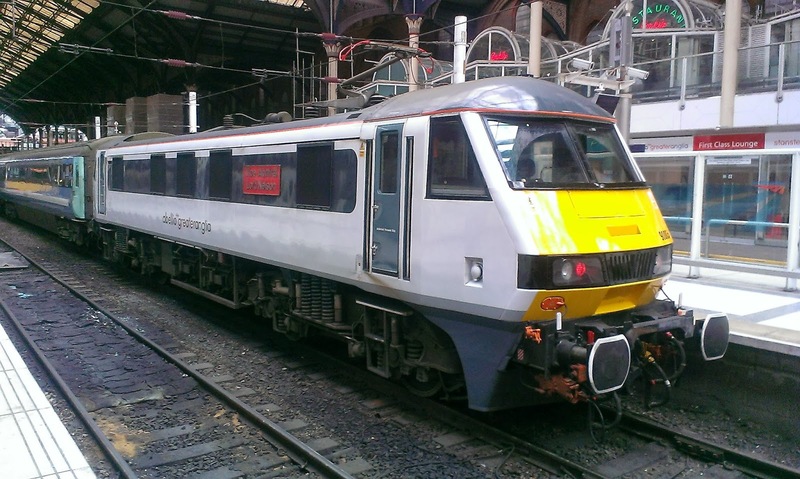 One shows newly painted loco 90005 looking spendid at Liverpool St. 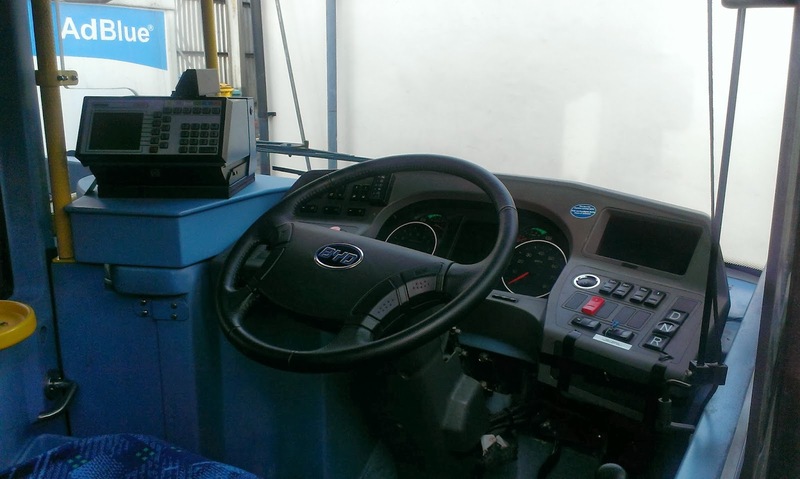 The other is a bit of a quiz - which bus is this a pic of the cab? All will be revealed when I get home. See you soon. Quiz time - what vehicle is this and where did I take the pic? Answer hopefully Thursday. I'm travelling down to Kent tomorrow in preparation for eye surgery in Sussex on Wednesday. If all goes well I'll be home Thursday evening but no idea how well I'll be able to see. 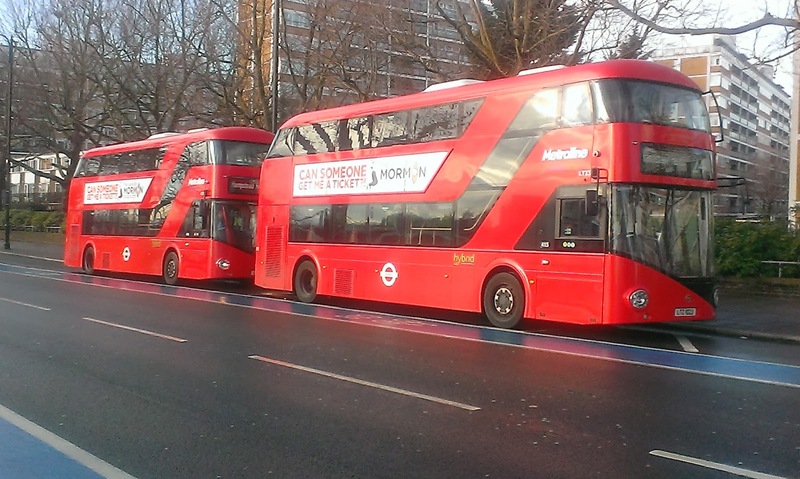 Anyway hoping to spend a lot of tomorrow in London sampling many Borismasters, electric buses and so on. 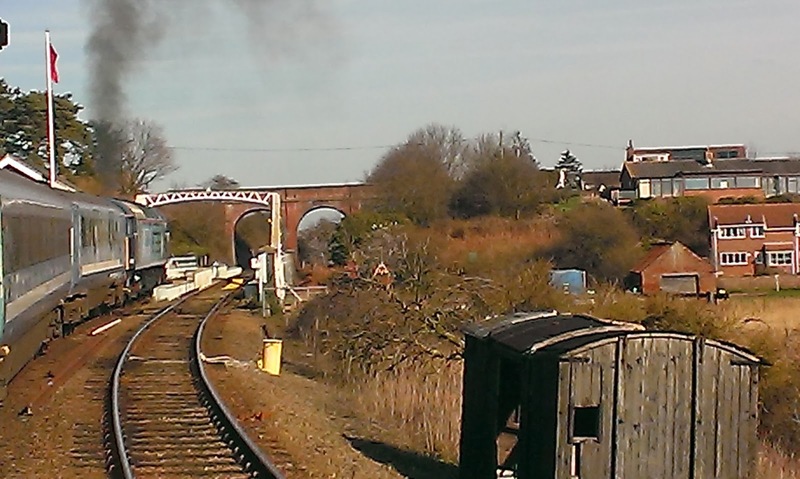 It will culminate in catching HS1 down to Kent so many photo opportunities which I'll post later in the week. A lot of attention has quite deservedly gone to 33423 this last couple of weeks as it is without doubt one of the more photogenic vehicles around at the moment. 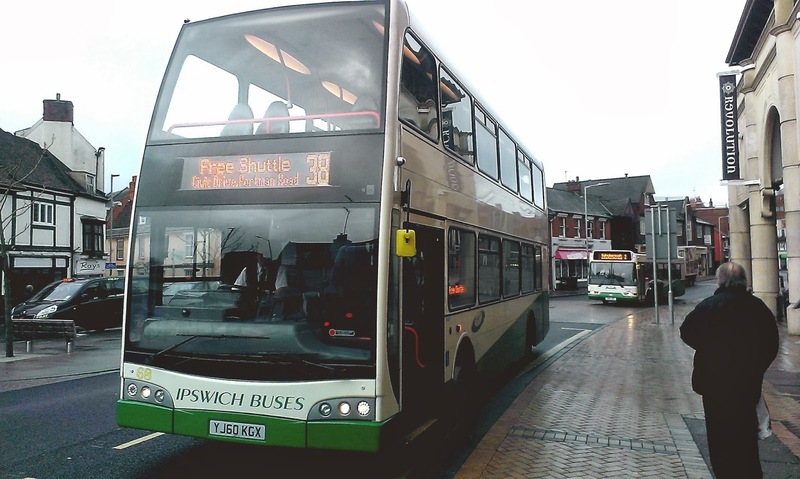 However, Clive Nixon, of Ipswich Bus Blog kindly sent me a pic of a vehicle I only travelled on a couple of weeks ago in her new colours. 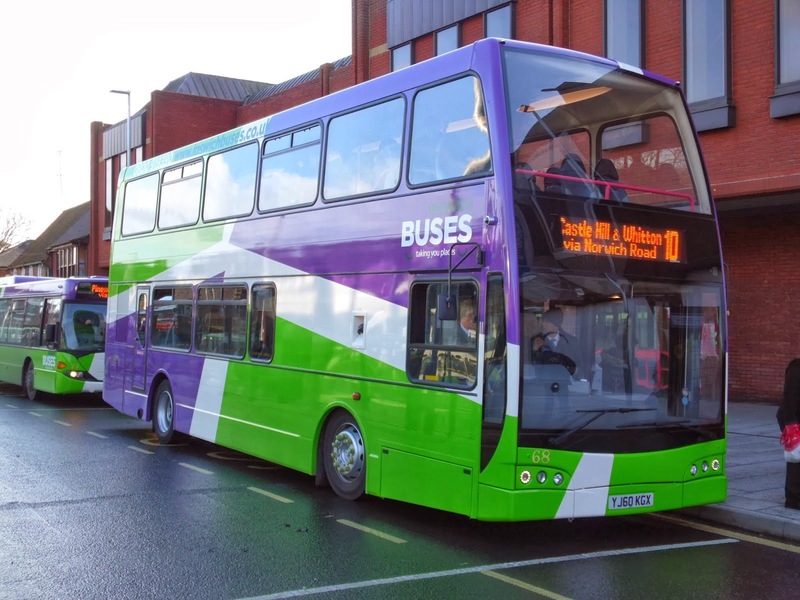 Ipswich Buses 68, Scania CN230UD Optare Olympus YJ60 KGX has been repainted into IB's "marmite" livery of green and purple. I call it marmite as you either love it or hate it. Personally it's growing on me and I think the Scania looks particularly good in it. Many thanks to Clive for the pic which remains his copyright. Yet again a stroke of luck this afternoon. I was at Market Gates when 33423 came in from Norwich. 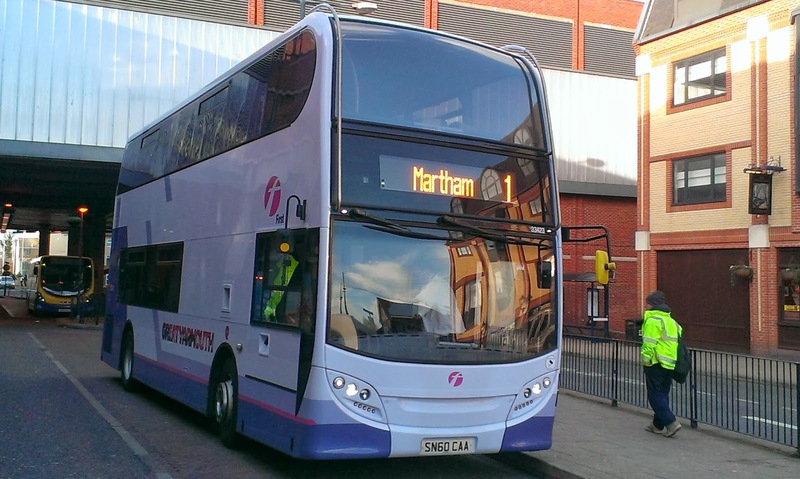 I was surprised to see it change the destination to show 1 Martham. A minute later it returned to X1 Yarmouth. 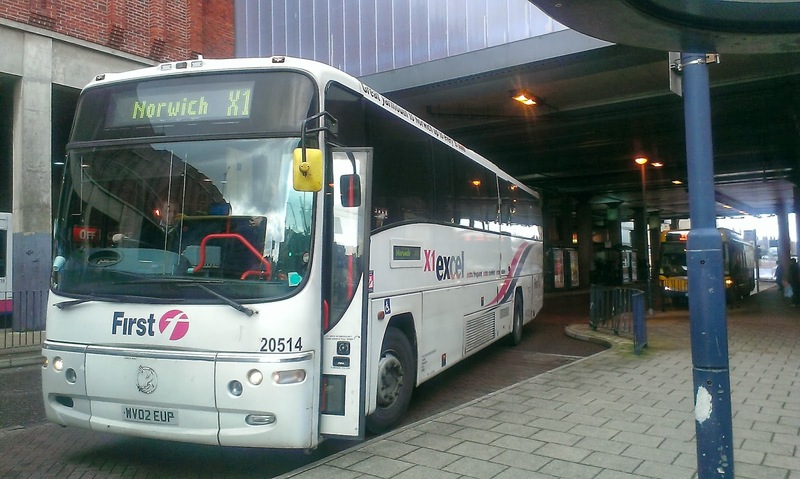 I enquired if it was going to be the 1600 to Norwich, which it was and I had a natter with the driver about the E400's in general "they nearly all rattle now" and it turned out a photographer was going to take a publicity shot of her when she got on the right stand. An opportunity not to be missed and so I joined in the photoshoot. It turned out that the destination computer had been re-programmed today and so the driver kindly put some of the more unlikely destinations we will see on it. Enjoy and remember they are for display purposes only!! I wonder if that will ever happen, and is there a "fast" service? 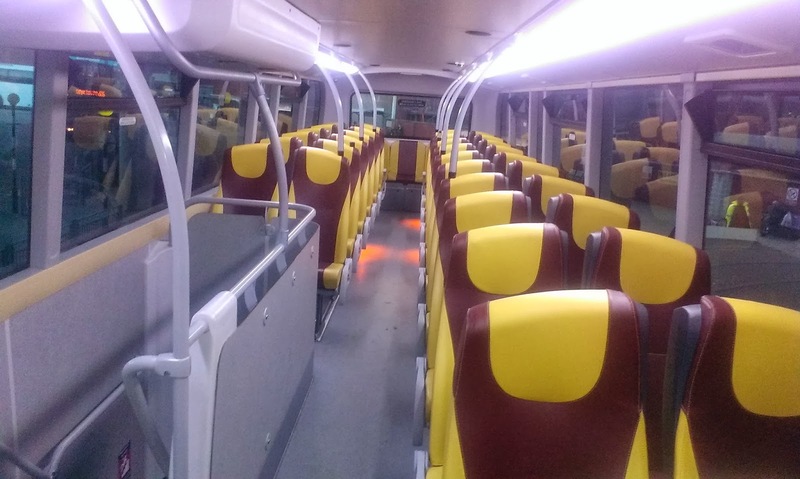 Finally I was asked to take an interior pic by a certain co-blogger, and actually that was a pretty good idea as not many will have seen the unusual interior of this bus. She goes well too, and even the rattles are tolerable. She also passed the text test, ie I was able to text on my phone quite comfortably, unlike while on 33820 earlier. 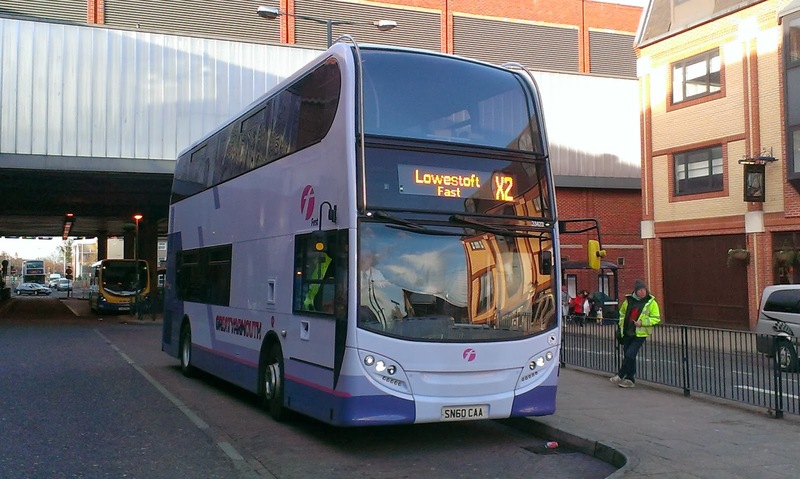 When I first started this blog it was pretty unusual to see a decker on the 101 Lowestoft town service. However over recent weeks it has become increasingly common. 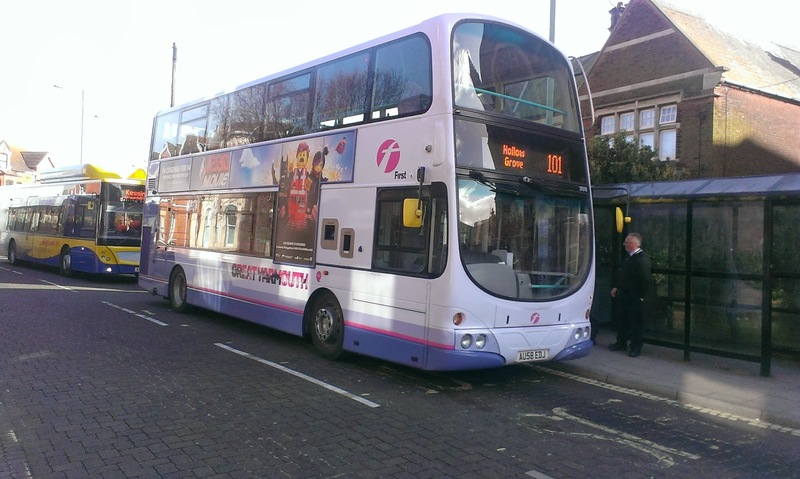 Today though there were no less than 4 deckers operating the 101, including one of Great Yarmouth's Gemini B9's. 30889/900, 37570 and Yarmouth's 37578 Perhaps someone in the know can tell me if the 101 is destined to become a decker route, or are so many Darts/E200's off the road it is a matter of necessity. 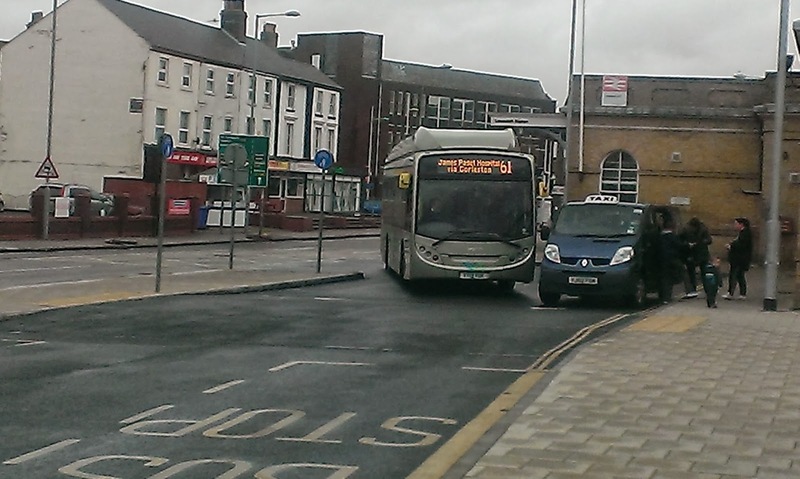 Also back at Lowestoft is X1 Excel coach 20515 which was on the X2 today. 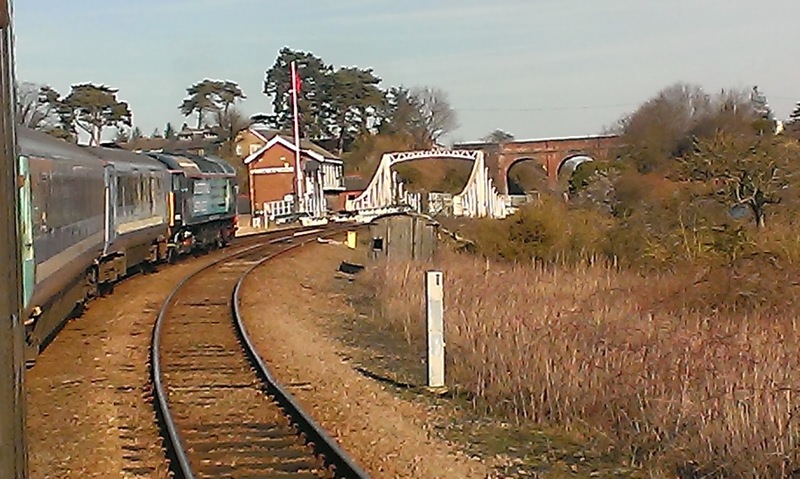 Sorry I didn't manage to get a shot of 37570 but trust me it was on the 101's too! 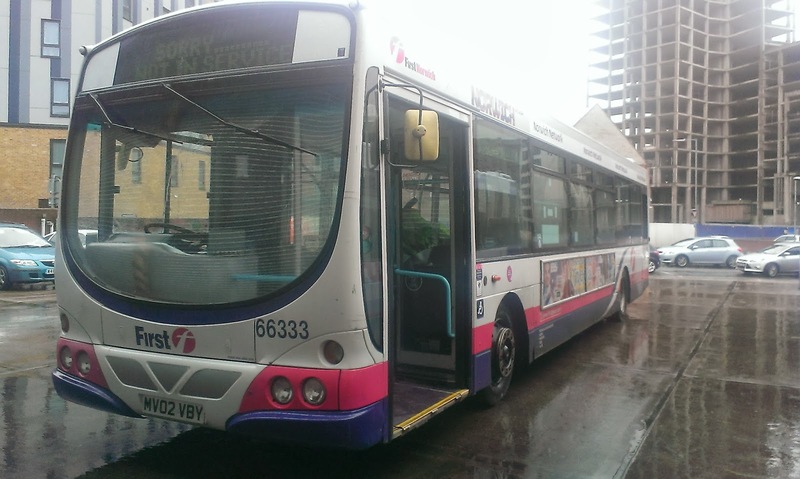 More details on the incident involving Ipswich B9rle 69005 in Stowmarket this morning. Apparently it hit a set of traffic lights and a florist shop. 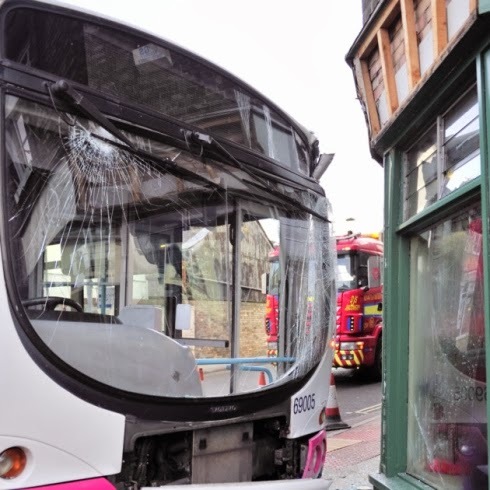 It has been confirmed the driver was not on board at the time and investigations are ongoing. Pic from EADT whose full report with additional pic can be found here. 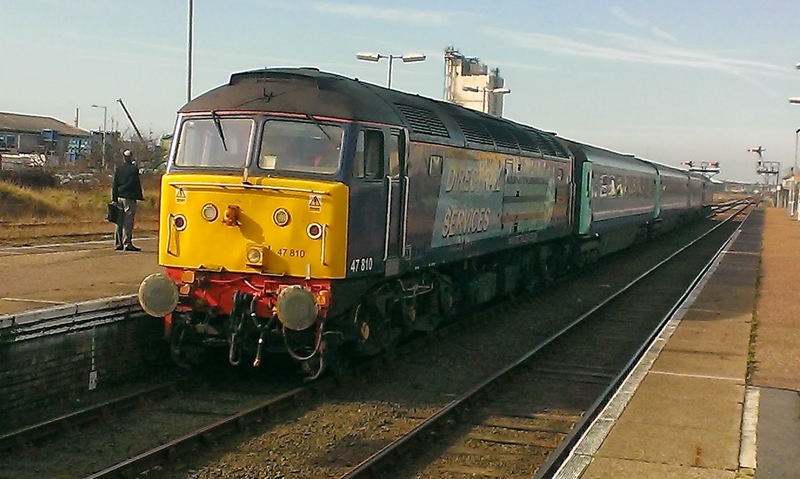 It has also been reported that 69005 crashed in Stowmarket today. details and hopefully pics to follow. 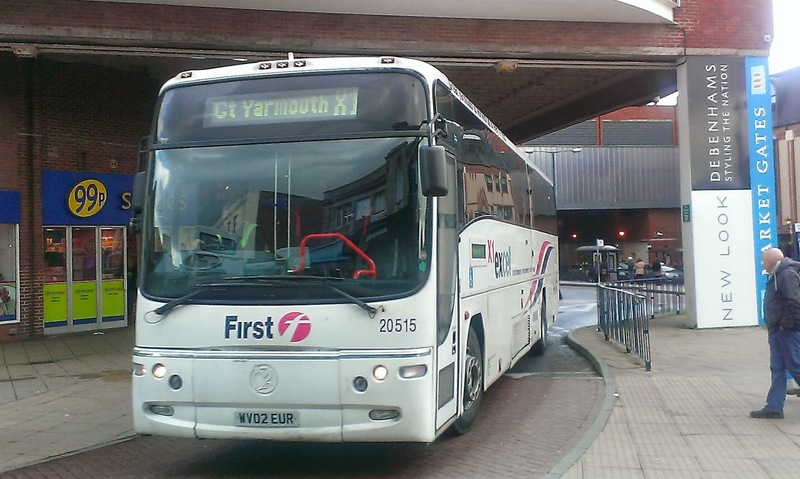 As you will know First Great Yarmouth are expecting some ex First Leicester ALX400 as well as a couple of Geminis - 32629/30. Well I can report that 32628/31/40-42 have been spotted in Basildon so does that mean the two Yarmouth bound are on their way? 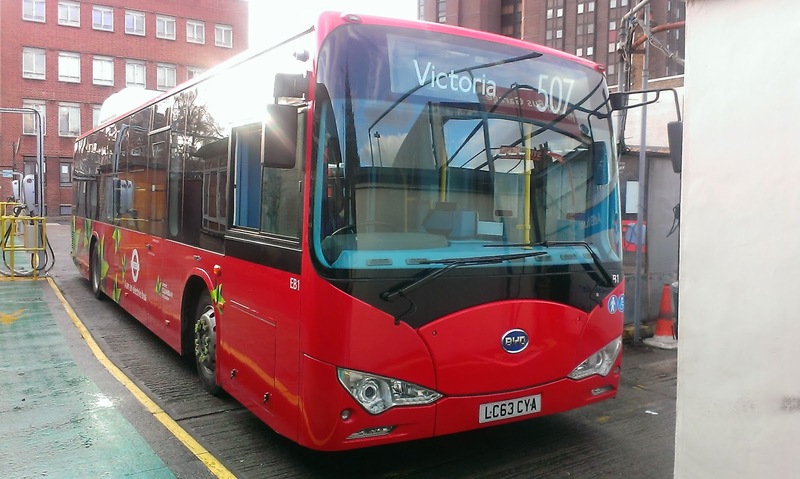 I know they are meant to replace the Volvo single deckers but it could mean a final death knell for the remaining Olympians. I am waiting to find out if the Geminis have been repainted and as soon as I know will update the post. 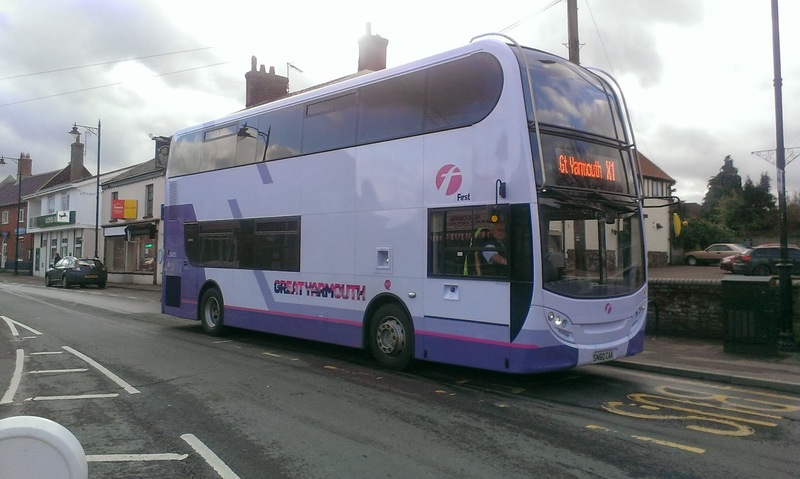 I have just found out and they have NOT been repainted, so it seems First's new policy of repainting vehicles moving to a new area has not been followed. 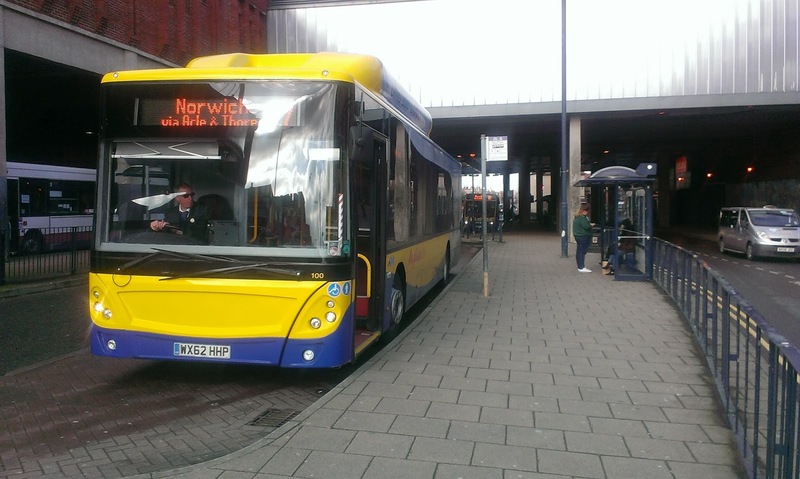 Update: Borderbus MD Andrew Pursey has told East Norfolk Bus Blog that a low floor bus wil be introduced on the route as opposed to using deckers. A much better day than yesterday and trust me 80 mins on a gas bus is sheer bliss compared to the bloody awful 80 mins on 65675 yesterday! Got to Yarmouth and had to wait barely 25 mins before 33423 came in Norwich bound. 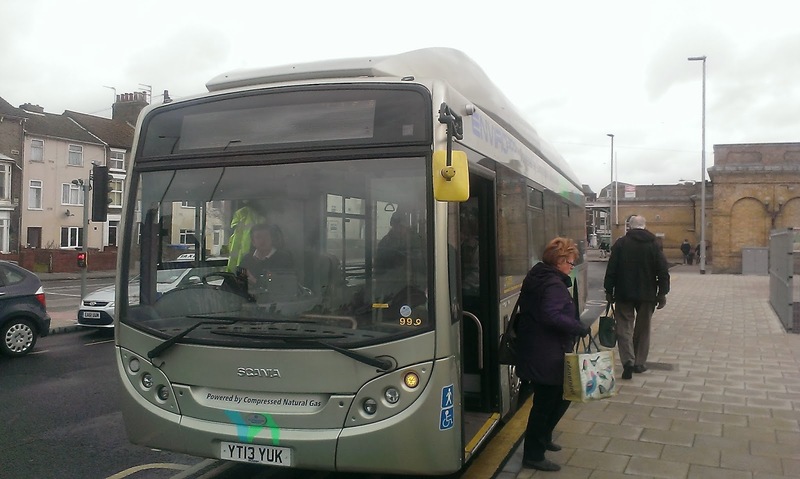 Got some pics of her then waited for Roy from East Norfolk Bus Blog to meet me. I managed to persuade him to accompany me to Acle to get some more shots of 33423 coming back, which we duly did, getting to Acle on Anglian Scania. 455. While we were waiting for 33423 to arrive Roy happened to mention that the short set was on the Norwich-Yarmouth route and it seemed too good an opportunity to miss. 45 mins on a cold, draughty platform has never gone so fast. 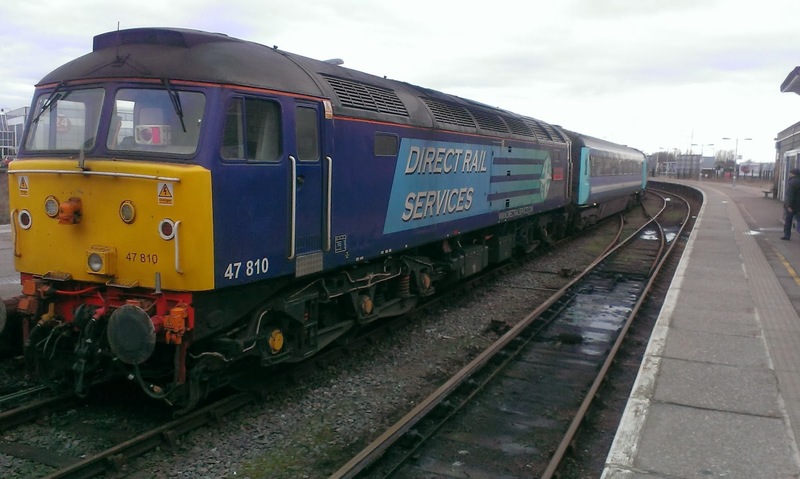 The anecdotes were in full flow and our patience was rewarded with 47810 leading a first class coach, a standard class coach, a driving trailer unit and 47841 on the rear. We sat in 1st class, obviously, as only befits distinguished bloggers, and a short but sweet journey to Yarmouth for more photos and a video. 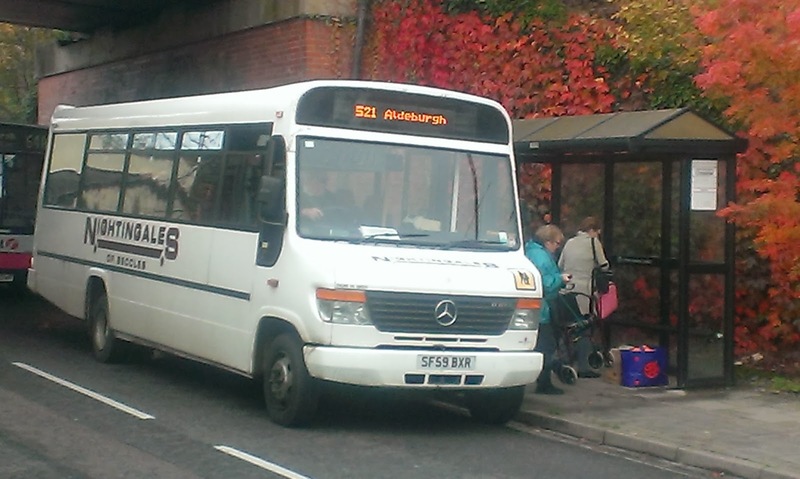 Then it was back on the gas bus to Wangford and mini bus home. Roy - thank you for your company on what turned out to be a great afternoon. I won't be getting out much for the next couple of weeks thanks to the limit on the number of minibus bookings I'm allowed being taken up by essential things, and eye surgery. However the eye surgery means two days in London so get ready for much Borismastering! So here are today's pics - more on Flickr over the weekend. Looking rather good 33423 SN60 CAA shows off her new outfit!